The Wave is a sandstone rock formation located in the United States of America near the Arizona-Utah border, on the slopes of the Coyote Buttes, in the Paria Canyon-Vermilion Cliffs Wilderness, on the Colorado Plateau. It is famous among hikers and photographers for its colorful, undulating forms, and the rugged, trackless hike required to reach it. Download free directions, maps, GPS and photo advice for The Wave by selecting the Maps and Directions tab above. The Wave - Paria Canyon Garmin/Google Maps GPS Coordinates: N36 59.743 W112 00.361 The trail begins at Wire Pass Trailhead, about 8.3 miles (13.4 km) south of US 89 along House Rock Valley Road, a dirt road about 35.4 miles (57 km) west of Page, Arizona or 38.6 miles (62.1 km) east of Kanab, Utah, that is accessible to most vehicles in good weather. During and after a storm the road may be impassable, even with a four-wheel-drive vehicle. Wire Pass Trailhead includes a wide parking lot with restrooms, but no water. It is also accessible from the Arizona side by taking U.S. Highway 89A from Jacob Lake on the Kaibab Plateau towards Navajo Bridge on turning north onto the House Rock Valley Road soon after descending from the Kaibab. 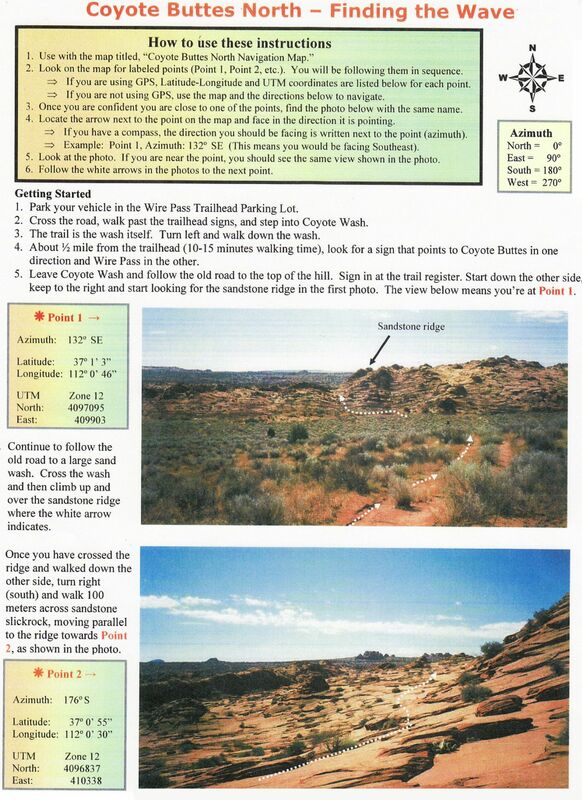 This is a much longer access route over dirt road than from the Utah side.From the Wire Pass Trailhead, The Wave can be reached by hiking approximately 3 miles (4.8 km) across open desert, making the round-trip to and from "The Wave" a nearly 6 miles (9.7 km) hike that climbs about 350 feet (110 m) in altitude. Temperatures in this area typically climb above 100f (37.8c) in the summer, so it is best to start the hike early. Anyone attempting the hike in any season is wise to be prepared for harsh desert conditions, including fierce winds, blowing sand, and little shade. "The Wave" is challenging to find. In an effort to maintain the natural integrity of the region, there is no formal trail to "The Wave." 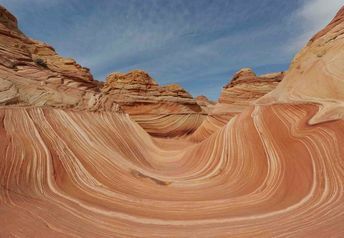 Most hikers are guided to "The Wave" either by GPS or a prominent landmark known as "the Black Crack," which is widely visible within the Coyote Buttes region. "The Wave" lies directly below "the Black Crack." Hikers must choose their own route across the open desert, which requires traversing exposed sandstone, sand dunes, and sandy wash bottoms. 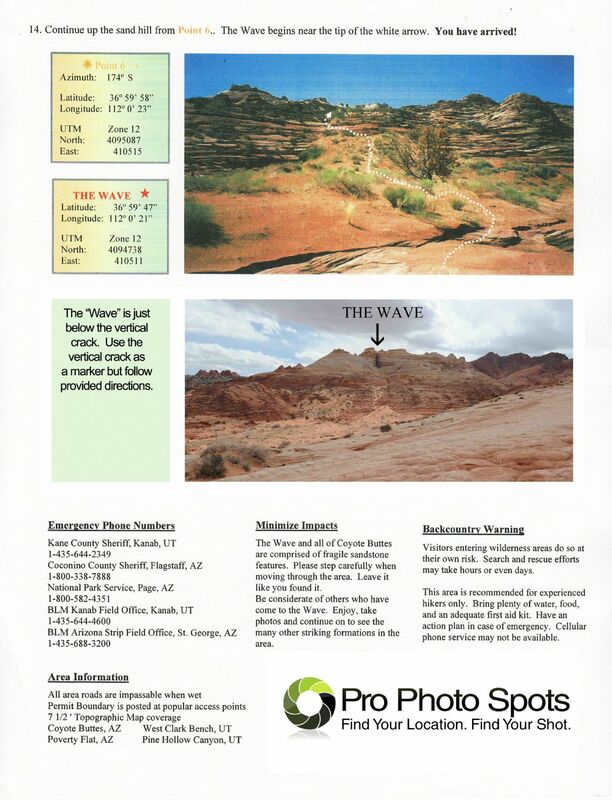 It is not uncommon for hikers to get lost and never find "The Wave." 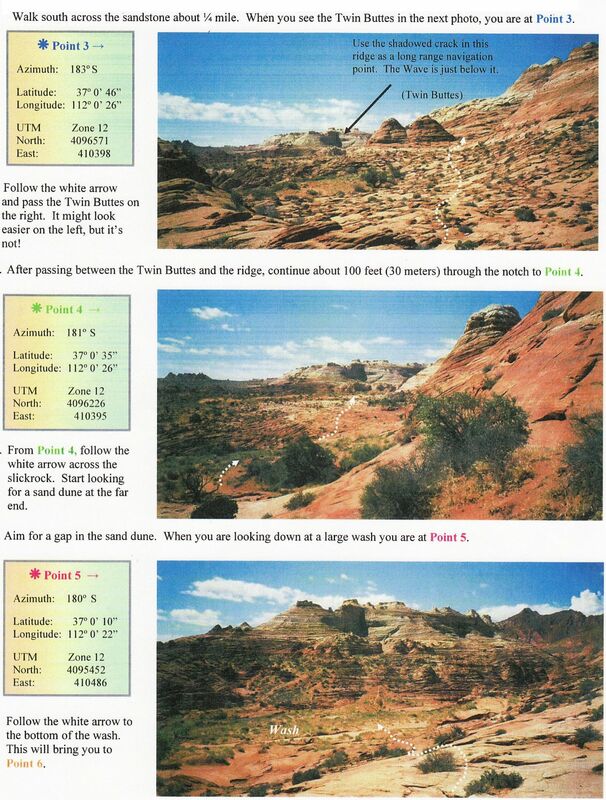 Guide sheets with color photos are provided at the Paria Ranger Station and the Kanab Field Office to assist hikers who succesfully obtain a permit via the internet or walk-in lottery. These detailed directions and maps can also be download and printed off the PPS website. The Interent Lottery runs 4 to 5 months before the the month one wishes to visit "The Wave." For example: For the month of May one would apply for a permit from January 1-31 with the lottery drawing Febuaray 1. Half of the available daily slots for Coyote Buttes North (The Wave) and Coyote Buttes South are issued online. The total number of permits will vary by group size, but the total available slots for each area is 20 persons per day. Ten are issued online. The other ten are issued as walk-in permits. 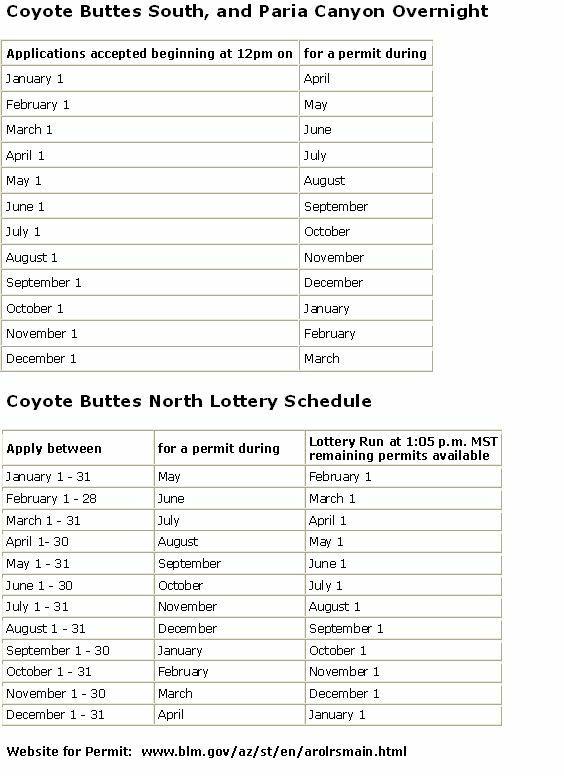 If you missed the lottery or are just in the Southern Utah/Northern Arizona area, you can obtain a walk-in permit at the Kanab Field Office from mid-March to mid-November, seven days a week. The Paria Contact Station is open from 8:30 a.m. to 4:15 p.m. MST (Utah). From mid-November to mid-March, permits for Coyote Buttes North or Coyote Buttes South can be obtained at the BLM Kanab Field Office, five days a week. The Kanab Field Office is open from 7:45 a.m. to 4:30 p.m. The Kanab Field office issues permits for Saturday, Sunday, and Monday on the previous Friday. The Kanab Field office will issue permits for holidays the last work day prior to the holiday. Walk-in permits are valid for the next-day. A permit/lottery schedule is provided with the map download from PPS. For those looking for the best time to photograph The Wave noon until late afternoon offers the best lighting. During the early morning part of "The Wave" has shadows due to the sun coming from right to left. I have photographed "The Wave" on multiple occasions and photos with blue skies/blue skies with cloulds tend to look the best. Photos of “The Wave” with grey/overcast skies do not have the same pop as it does with clear skies. After photographing The Wave explore the area for other unique rock formation and arches. The is also a 2nd Wave about a half mile past the first wave. However, the 2nd wave is not as photogenic as the first wave. If you do not get the permit for "The Wave" there is still plenty to do in the area. The succes rate for the lottery is about 20% so one may need to fill in a few days of other hiking/photo locations until a permit is obtained. Please Note: The lottery system is in place to protect the fragile surface that makes “The Wave” so special for those who enter without a permit and are caught major fines can occur.